German idealism begins with Kant’s epistemology as a synthesis between the rationalist and empiricist schools of thought. Knowledge was previously dichotomized divided between a priori and a posteriori propositions; a statement was true/false through verification with/without experience by necessity. However, such a distinction had been wrongfully conflated with grammatic structures in language systems derived from Aristolean logic; continuing the dualstic tradition, Kant makes the finer distinction that predicates can either be wholly contained within the subject (analytic) or outside it (synthetic). The structural deconstruction of propositions could then be classified under analytic-a prior (definitional), analytic-a posteriori (impossible by definition), synthetic-a priori (questionable), and synthetic-a posteriori (common-sense). The rationalists restricted truth-claims to only the analytic-a priori i while the empiricists to that of synthetic-a posteriori with both camps mutually rejecting claims of the other. Kant argues that the propositions in metaphysics, geometry, and mathematics are synthethic-a priori where truth-claims outside the subject can be made without an appeal to experience; Proving such claims require a “transcendental argument” or an appeal to necessary assumptions that structure all apprehensions and mental acts. Kant argues that all our intuitions (perceptions) must be organized along some manifold of space and time which is outside the subject. To experience an object requires a representation along spatial-temporal axes; objects must occupy (be delineated in) a region and we mentally arrange our intuitions in sequences (succession) to create separation through memory (time). 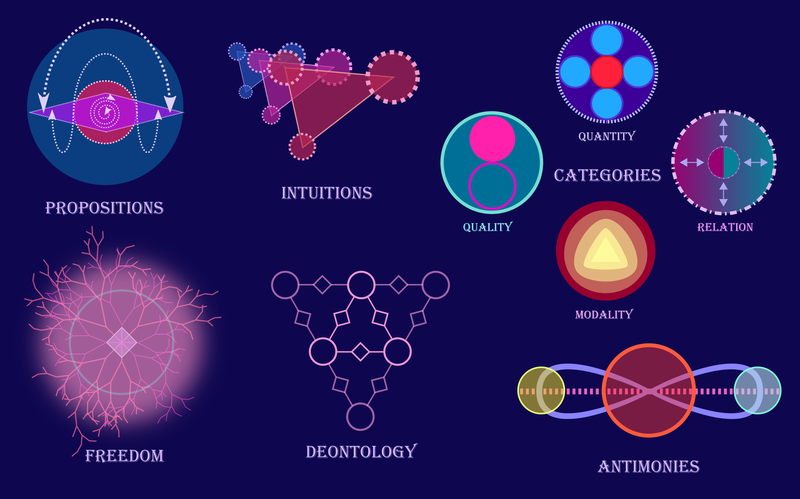 The representation must be further differentiated into conceptual structures (categories for organizing things in space-time, schema) for our sensible inputs to become things; our things have quantity (unity as one percept, plurality as many percepts, totality as union of all percepts over moments in time), quality (negation as the normal-state, reality as the abnormal state or something is present in tlme, limitation as occupying the present amongst many), relation (inherence/subsistence as a persistence of subject or the temporality of predicates over time, causality as necessity of percepts from their antecedants in time, reciprocity as the dynamics between predicates of different subjects), and modality (I liken this to a probability space of different realizations and their covariances). Such a schema both enables and limits the sort of metaphysical truth-claims that one can make. Many of those posited by the rationalists are shown to be provable from both the original assertion and their negations using transcendental arguments; “antinomies” such as space-time has a beginning/end and space-time is infinite are shown to be beyond the scope of reason. In restricting the space of knowledge as derived from the systemizing function of reason and the limitations of phenomena (the thing in itself or noumena can never be known), Kant leaves its complement open to faith. Kant’s ethical work concerns the universality of duty (deontology) on the premise that morality presupposes freedom of which reason can not demonstrate but must assume to have; relegating actions to causal laws undermines reason’s ability to affect will. Things in the world are thereby classified as having or not having reason (actors and things that can only be acted upon or can only follow causal laws). As actors, the principles from which actions are made must treat other actors as ends in themselves rather than means to ends; failure to-do so would undermine the freedom that reason presupposes, turning man back into animals (freedom is a good). The consequence is the universalization of maxims into laws that do not undermine the freedom of all actors on principle (categorical imperative); the morality of an act is judged not upon realities but on its motive and reason. I find such laws similar to Rousseau’s general will and analogous to convergence laws that lead to globally optimal solutions. This universalizing perspective will be radicalized by later German philosophers such as Fiche, Schelling, and Hegel (whom I’ll be concerned with next) through its broadening from moral judgments to all of reason. Hegel sought a universal law that would explain development of self-consciousness, experience, reason, and reality in terms of dialectic from the ground-up (evolution of spirit/mind). Its starting point is anthropocentric as it posits human awareness as fundamentally concerned with the relationship between self and other. The lord and bondsman (master/slave) analogy is a primary example where two consciousnesses seek self-determination through mutual recognition but fail to do; the lord identifies with his power over the bondsman through penalty of death while the slave identifies with mastery over/objectification of the environment in compensation of the threat by his master. Neither parties become fully self-determined or free as the recognition is asymmetric. The lord cannot kill his slave for otherwise he loses his identity; the bondsman remains powerless in other affairs. This struggle towards the self-determination of individuals cannot be resolved outside of ethical life (e.g. personal morality) whose concrete form would ultimately be actualized in the State. Such a process is grounded in Hegel’s logic which has a triadic structure. The triadic-dialectics of Hegel (abstract, negative, concrete) and Fichte (thesis, antithesis, synthesis) posit that propositions/claims have flaws within themselves which cannot be resolved unless mediated by thing outside the context; a pure being (awareness in itself) is indistinguishable from nothing and thus require something determined or concrete as a mediation (a more recent example may be the hand-held spear negated into a thrown spear and then synthesized into bow with a quiver of arrows). From the resulting concrete/synthesis, the two lesser moments are sublated into higher categories and the process repeats until a future equilibrium (progress). Hegel’s principle posits a cognitive tension or paralysis between abstractions (ideas) and their indetermincies which can only be realized through something more concrete (ideas and our awareness undergo differentiation which are eventually realized in sensible things). Every resolution of previous flaws/contradictions expands both possibility/realized spaces while new antagonisms emerge from their mediations. Man (humanity) thus becomes self-determined when he achieves a unity between the abstract universality (uncoerced choice, will in-itself) and the subjective-will (can give concrete expression to will) through the State and the multi-faceted social, economic, and political institutions that arise. Further analysis is beyond the scope of this blog entry.